APPEARANCE: Pours a hazy, sediment filled golden raw honey color. Loose soapy egg shell colored head that stuck around just long enough for the picture before quickly dissipating. The appearance is nice looking but nothing out of the ordinary. AROMA: Wild flowers blowing in the wind, soft perfume fragrance, followed by inviting citrus hops with hints of fresh lemons and odoriferous mango. Slight sweet cookie, bready malts with a back end of orange spice hot tea. The nose is really quite amazing. TASTE: As if i’m sitting at a table drinking orange spice tea, eating sugar cookies with a piece of candied orange on top. Malt forward but not over done, hops balance out nicely with a enjoyable bitterness. More of the mango I got on the nose with additional tropical fruits swirling around. MOUTH-FEEL: Medium body until the bottom half of the glass when the sediment was noticeably bringing the body to a medium plus. Light moderate carbonation, slightly soft and creamy with an enjoyable mellow finish. 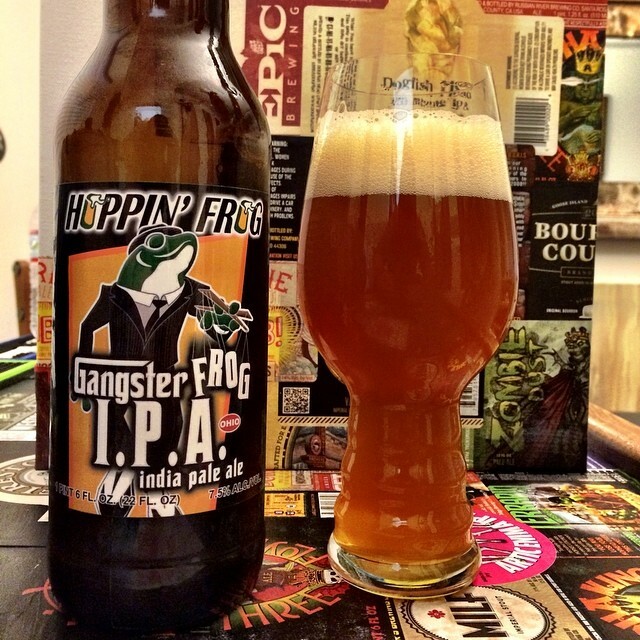 OVERALL: First IPA by Hoppin’ Frog. it was all around very enjoyable and easy to drink. definitely not a palate wrecker which is actually a nice change in pace. I think the nose on this beer was the highlight for me. great job Hoppin’ Frog! This entry was posted in Ales/IPA, Beer Reviews and tagged #beer, #beergeek, #beerme, #beernerd, #beerporn, #beerreview, #beerzombies, #craftbeer, #craftbeerlover, #dtlv, #lasvegas, #lv, #zombie, #zombies by beerzombies1. Bookmark the permalink.